President Trump speaks at the APEC CEO Summit, in Danang, Vietnam on November 10, 2017. 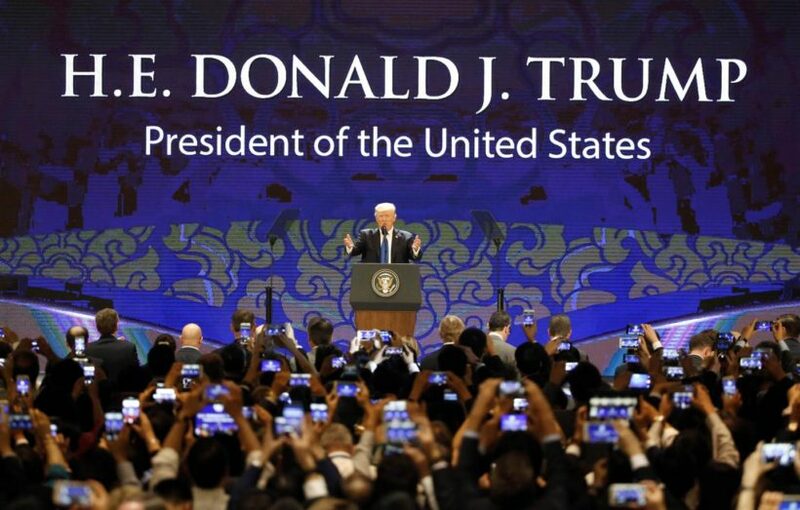 (by Ryan Pickrell, The Daily Caller, Nov. 10) – President Donald Trump shared his vision for Asia with regional leaders at a conference in Vietnam Friday. 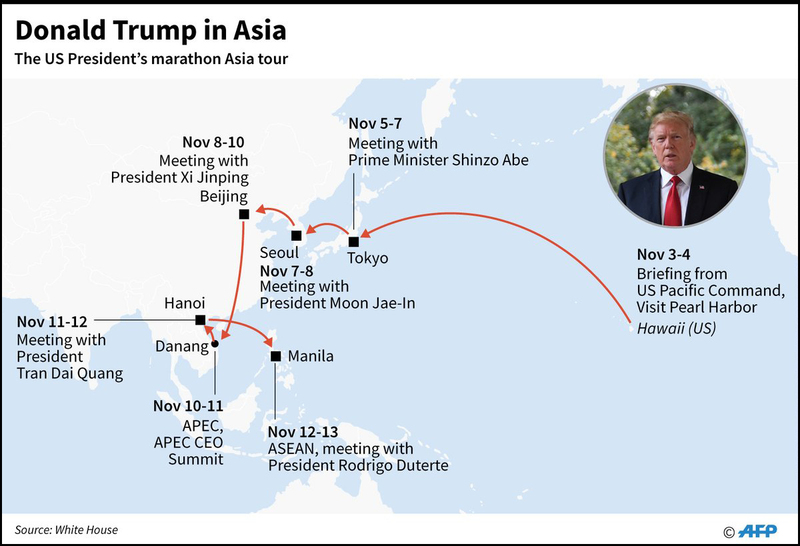 Speaking at the Asia-Pacific Economic Cooperation (APEC) summit in Vietnam, the fourth leg of a five-nation tour across Asia, Trump emphasized sovereignty and independence, freedom, fair trade, and the failures of past administrations to secure a realistic role for America in the region. “In more and more places throughout this region, citizens of sovereign and independent nations have taken greater control of their destinies, and unlocked the potential of their people,” the president said. The president stated that the days of “chronic trade abuses” are over, reminding all countries — China in particular — that the U.S. will no longer tolerate the “audacious theft” of intellectual property or the forced transfer of technology to foreign firms. Trump avoided blaming China, putting the burden of guilt on past administrations. The president condemned sweeping multilateral agreements like the Trans-Pacific Partnership (TPP) — “large agreements that tie our hands, surrender our sovereignty, and make meaningful enforcement practically impossible.” The 12-nation pact was a controversial multilateral trade deal orchestrated by the Obama administration and opposed by many Americans. Trump withdrew from the agreement. The president also expressed a broader vision for a “free and open Indo-Pacific region,” a plan which appears designed to curb China’s growing clout. During the APEC meeting, Chinese President Xi Jinping also spoke, presenting an alternative vision emphasizing globalization and multilateral cooperation between Asian nations. Competing visions and opposing strategic interests are likely to continue to create friction between the U.S. and China. Find the answers to #1 at the CIA World FactBook website. Answers can be found under the “Geography” “People” and “Government” headings. b) What vision did President Trump share with the leaders of the APEC countries? c) In his speech at the APEC summit, what did President Trump say the U.S. will no longer tolerate? d) In a message he has emphasized before, President Trump also said, “We are not going to let the United States be taken advantage of anymore. I am always going to put America first, the same way I expect all of you in this room to put your countries first.” Do you think this is a good policy for our country to have? Explain your answer. 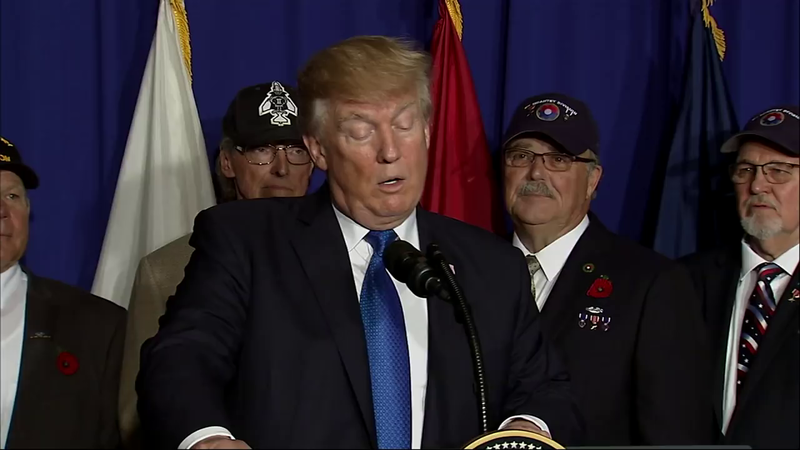 Did you know President Trump marked Veterans Day during his time in Vietnam and met with seven Vietnam War veterans on Friday in Da Nang, Vietnam? He also signed a proclamation saluting Vietnam vets.